Philly is a very walkable city. It's easy to get around, most sights aren't too far from each other, and thankfully cocktails (and gelato) are never too far away. 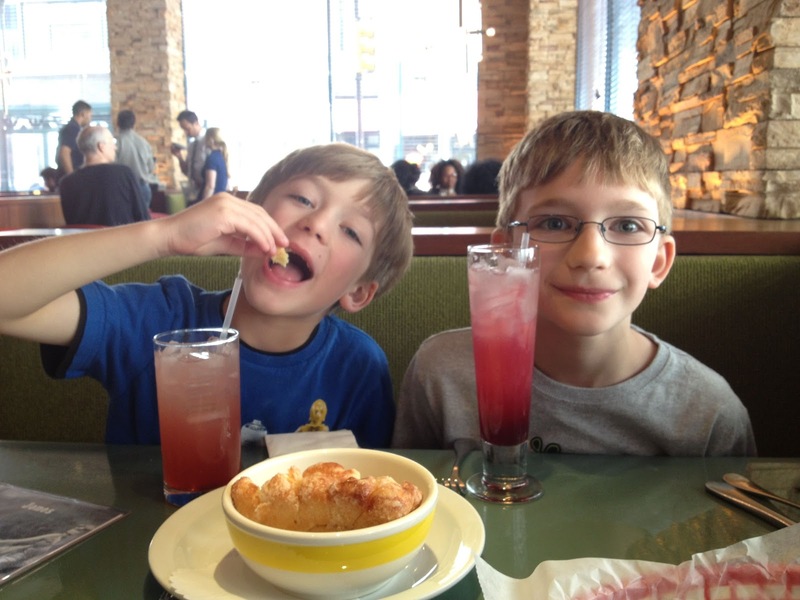 We found some great bars and award winning restaurants to explore with the kids last spring, and again last December when we were accompanied by the C&G Grandparents. 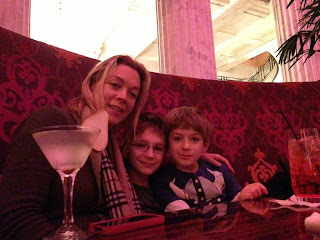 After a full day (and a miserable lunch) at the Franklin Institute we were ready to make up for it with some phenomenal cocktails. Across from City Hall is the lovely Ritz Carlton hotel, located in a former bank building. Under a beautiful marble dome, the 10 Arts Bistro & Lounge offers the perfect setting for some refreshing cocktails and snacks. Their swanky lounge is a welcome sight at the end of a long day of adventures. The cavernous room can be loud, but it's perfect when you've got some overtired kids who might be bouncing off the banquettes just a little. The lounge is in the lobby of the hotel and there's plenty of people watching and room for the little C&Gs to roam. We ordered some cocktails and snacks from the lounge menu and sat back while the little C&Gs bounced their way from empty couch to empty couch. With so much activity going on they pretty much went unnoticed. And we had a lovely relaxing cocktail hour. Just down the street from the Ritz Carlton is the café, bar and restaurant XIX, on the 19th floor of the Park Hyatt hotel. The bar here seems a little more buttoned up, but I've found that hotel bars are generally kid friendly. The couches looked very comfy and I can see how this would be a popular spot after 5:00. Around 4:00 they were pretty empty so it was fine, but I don't know that we would have gone with the boys any later than that. It was a beautiful spring day so we asked for a table outside on one of the balconies. 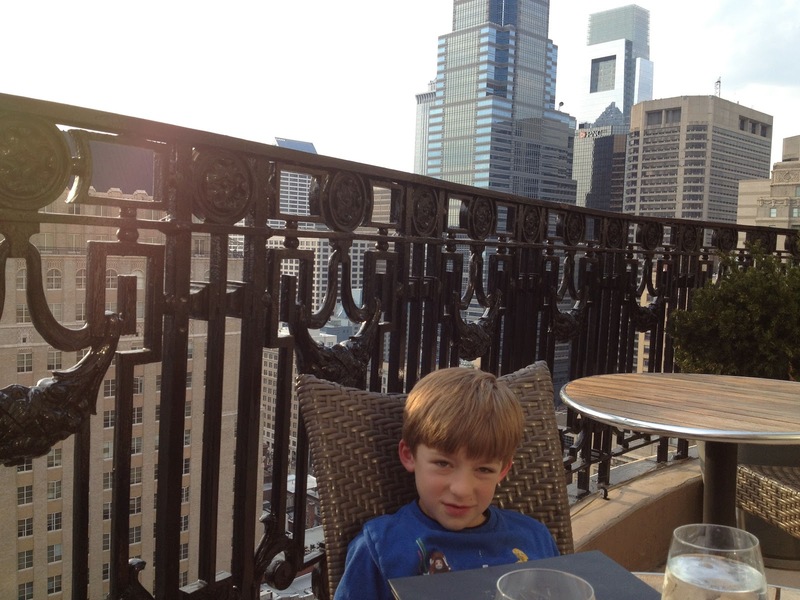 After ordering drinks and some french fries we sat back and admired the Philly skyline. The little C&Gs made a fun discovery while we were waiting for the elevator to head back downstairs. The beautiful baroque breakfast room was empty (the balconies & elevators were off this room) and the little C&Gs had fun playing with the acoustics. If you stood on one side of the room and whispered, they could hear it on the other side of the room. Maybe not such a great spot for a power brunch? If you'd like to start your day with cocktails and you're headed towards Independence Park, be sure to stop by the retro restaurant Jones. The decor looks like it was smuggled off the set of the Brady Bunch, but their food is always delicious and the cocktail menu extensive. 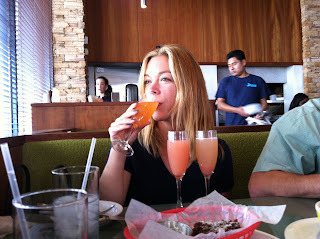 You can custom order your bloody mary (they give you a little notepad and a pen) or order a Bellini tasting flight. Be forewarned, as you can see in the picture above their definition of "tasting" is a little different than most peoples definition of "tasting". But trust me, after we left there and headed to Independence Park, the Liberty Bell never looked so interesting . . .